Welcome to the first in a multi-part column looking at the build-up to London Comics in March, when three festivals, and several exhibitions run on the same day in the nation’s capital. Saturday 22nd March, here it comes. Firstly though, a plug for myself : Comics Village can’t afford to wage me from these columns and the paypal contributions to drewdotluke at gmail dotcom have been non-existent. What’s a nickel ? 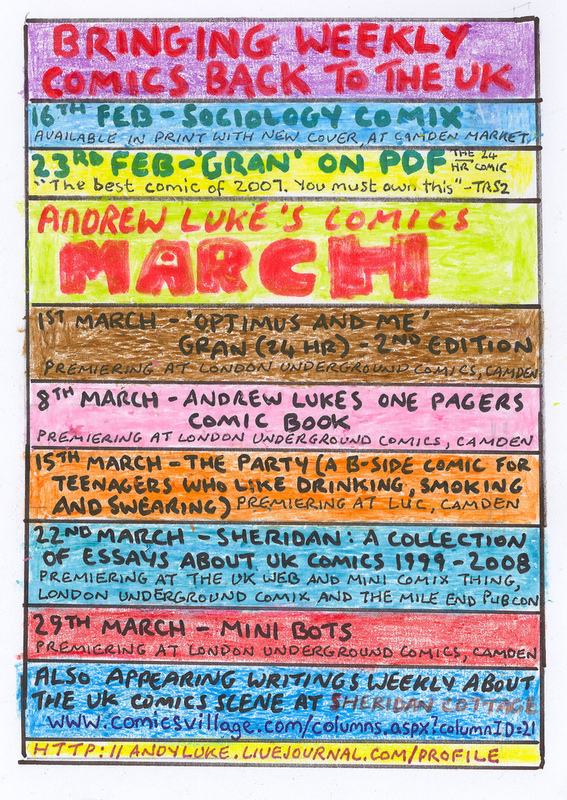 Weekly comics in March : Yep, that’s the empowerment of Camden people ! I write this section on a pleasing seat, with a deep coffee beside me, loud ambient working beats and a very pleasant bakery aroma. 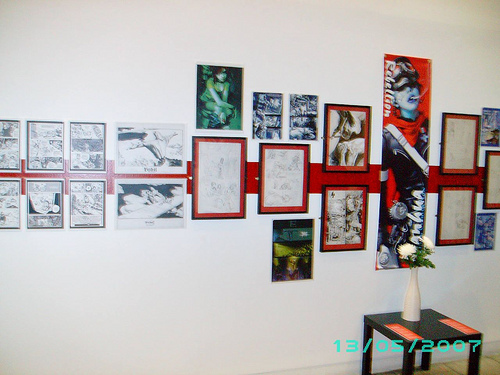 Perhaps the UK’s first ever comics shop, café and gallery, saleable frames and canvasses taste up the walls. Outside one of the staff, Ryan, takes great delight shouting, “Comics and Cakes”. 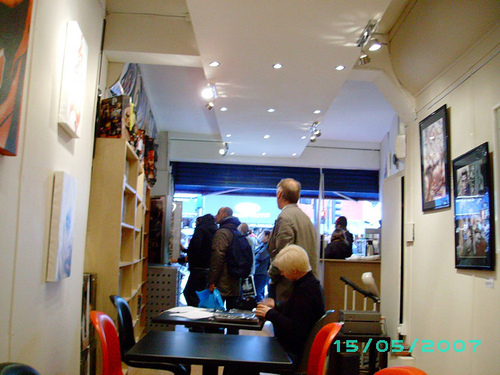 The front entrance contains a rack of Brodies Law comics and collections, a poster flipcase, and customers are actively looking at about 400 different graphic novels and a selection of toys. There are no doors on this venue and its warm. It’s not the completed work as setting up shop is still going on, work is commencing on the basement section of toys and graphic novels. New comics too, I pick up a copy of the first part of the Ennis/McCrea JLA/Hitman. Jack Brodies’ gallery is presently open for business with an official launch party this Saturday 15th March. No more details are available at this time, though keep an eye on Bugpowder during the week. The name taken from the comic book character in Brodies Law, Jack Brodies is situated at 267 Camden High Street, on the crossroads with Jamestown Road. Why am I boycotting the UK Web and Mini Comix Thing ? In a nutshell. At the end of the day, we’re all big boys and girls and most of us knew what we were getting into. Next week I’ll cover the travel arrangements for those who would like to attend several of these events. In the meantime, if you’re ‘locked in’, be it Camden, The Thing (or Orbital) on the dot of 3pm, don a V mask, to show some solidarity to your fellow cartoonist at another event. Alternatively, Oli Smith is a big enough media figure that his image is plastered everywhere. If you have the time why not copy and print out his image, or draw your own rendition, and get the whole punch and head-tie material to create an audience of Olis. Doors open at 9am and aren’t in the least visible until 6pm. Theres a facebook event been created and cartoonists may put their self-published comics on the tables were practical for £3 for the day. Stock is always circulated. With more surprisers to manifest ! Above the “not four but three stalls”, and beautiful scenery of Camden is the bar and restaurant, Lock 17. Its in the line-up as the expected venue for a larger comics Pubcon Event held sometime in June is expected to be discussed in more detail at the Camden Something Event. I’ve also been hearing a lot of rumours that an alteration of the Creators Manifesto will be discussed in preparing for mounting festival charges, as well as the creation of The Beagle Awards. Theres also live drawing events and study workshops coming up in the near future. See the ever excellent resource http://www.paulgravett.com/events/events.htm for more details. 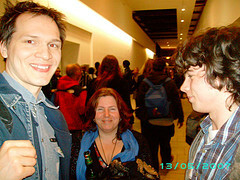 Friday 21st through to Monday 24th March are the dates of this traditional fan convention event. Held at the Radisson Hotel, Heathrow, enchants with its headline guest, Neil Gaiman..
More details on Orbital Eastercon through their website. I may yet decide to attend on the Sunday or Monday. In terms of reporting on this, a press pass has been denied to Resonance Fm’s Alex Fitch who was directed to agents for interviews. For five years now this has been a stable feature of the Uk comics scene. It enjoys a soft spot in creator’s hearts as in its early days it revolutionised the comics festival scene, placing the phrase ‘mini-comix’ loud on maps, and acknowledging that together with webcomix this be an area of contextually powerful significance. Obviously at £66+ I’d urge those who have booked not to bother. The Thing boasts a show of some of the more productive non-professional journal UK cartoonists doing their stuff for the likes of it. I really hope it succeeds to get some of the non-comics reading public through its doors. Of particular note is the festival booklet which is a well bound with some colour over 100 pages showcasing most of the artists exhibiting. After paying the £4 entry charge, this book is usually available for 50p which is a real bargain. Doors open at Mile End 10 – 5pm, exhibitors can set up their crafts from 9am and are expected to be gone by 6pm. Ordinarily I use Smooth Hound to find accommodation but if you’ve no luck with the Travel Lodge offer I’d recommend http://www.laterooms.com/ and http://www.hotel.com which a good source tells me offer cheap accommodation at short notice. Undisclosed sources have told me that this years Thing may certainly be the last, which contradicts the organiser’s statement. I’m inclined to go with my sources on this one – say goodbye to the venue for me. I’ll go onto chat about pub cons in a future column, but for now heres some the details. The food and beer is cheap, the length of waiting time is appalling and the social craic is absolutely marvellous ! In previous years we’ve seen Camera Showdown, Tattoo frenzies, and prohibited leprachauning. This year should be a good one, as long as folk don’t form a picket line around the bar or chant scab. In Part 2 of Maps At The Crossroads I’ll provide specific travel details covering travel between and around festivals, which those of you not familiar with London may find helpful. (preview) I’ll also be updating on any new news, including reports on this Saturday’s launch of Jack Brodies.